Identify what your student needs to learn. Skip the “rule drills.” A sophisticated instructional program simple enough for teachers and aides who don’t know all the phonics rules. Move easily into decoding two-syllable words. But students with dyslexia and other reading disabilities need structured programs that meet their needs. Fun Phonics teaches reading and spelling skills to students in Grades K-6. It is a high quality, research based program for teaching struggling readers. Quality materials developed by a leading expert are research based and classroom tested. Excellent materials to jump-start students in Response to Intervention programs. 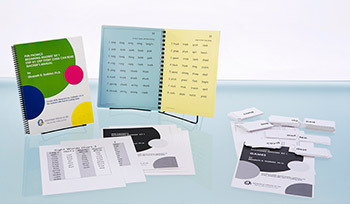 The complete Fun Phonics Series consists of four components.